The Splintered Ukes are a group of ukulele players with an eclectic taste in music, from classic hits of the 70s and 80s to more recent hits, but definitely not the traditional ukulele fare you might expect from this little instrument. ​Based in Liverpool they are to be seen out and about around town or at city events and festivals. Amazing musicians playing all the best tunes. Love them so much we booked them for our wedding. 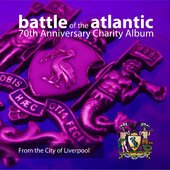 We contributed a track, 'Swinging On A Star' for the Lord Mayor of Liverpool's CD "Battle of the Atlantic " that was released to commemorate the 70th anniversary of the battle of the Atlantic. All proceeds went to the Lord Mayor's Charity Appeal: The Linda McCartney Centre, The Whitechapel Centre, Variety - The Children's Charity and The Michael Causer Foundation.